KIEV, Ukraine -- The Ukrainian president has warned that Russia could soon attempt to stage an invasion, as the two nations are in the midst of a “real war”. 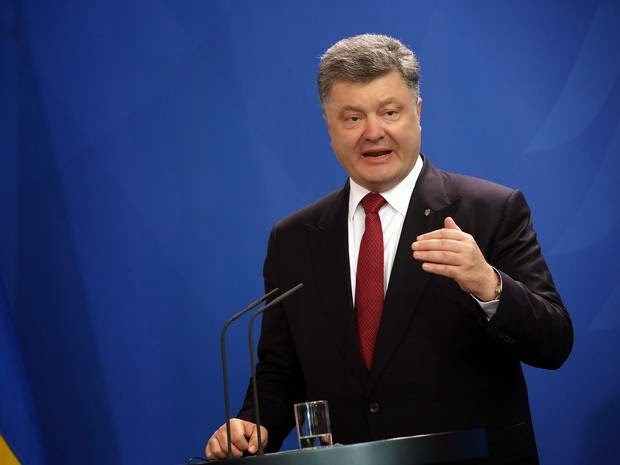 "This is a real war with Russia," Poroshenko said. Petro Poroshenko made the worrying suggestion after four Ukrainian servicemen were killed when fighting erupted between Russian-backed separatists on Tuesday. The president told BBC News that he believes Russia will attempt an "offensive" in the summer months. “I think we should be ready and I think that we do not give them any tiny chance for provocation. That will totally be their responsibility,” he said. Mr Poroshenko told the BBC: "Can I be absolutely clear with you this is not a fight with Russian-backed separatists, this is a real war with Russia. "The fact that we captured...Russian regular special forces soldiers [is] strong evidence of that." He went on to say that he has to engage in negotiations with Russian president Vladimir Putin, despite the fact he does not trust him. Responding to Mr Poroshekno’s comments, Kremlin spokesman Dmitri Peskov told BBC News that there was a "serious lack of trust" between the two countries. He argued this was rooted in "specific broken commitments and... failure to implement the provisions of signed documents". Russia has denied that it is aiding anti-government rebels operating in Ukraine. However, Ukraine on Saturday captured two men in the Luhansk region, who officials believe were elite Russian soldiers. Earlier this week, separatist rebel commander Aleksy Mozgovoi told The Independent that the detentions raise doubts about the durability of the ceasefire. "Escalation and more deaths are inevitable. There is no sense for us to lay down our arms while there is a government in Kiev that is against the Ukrainian people," he said.